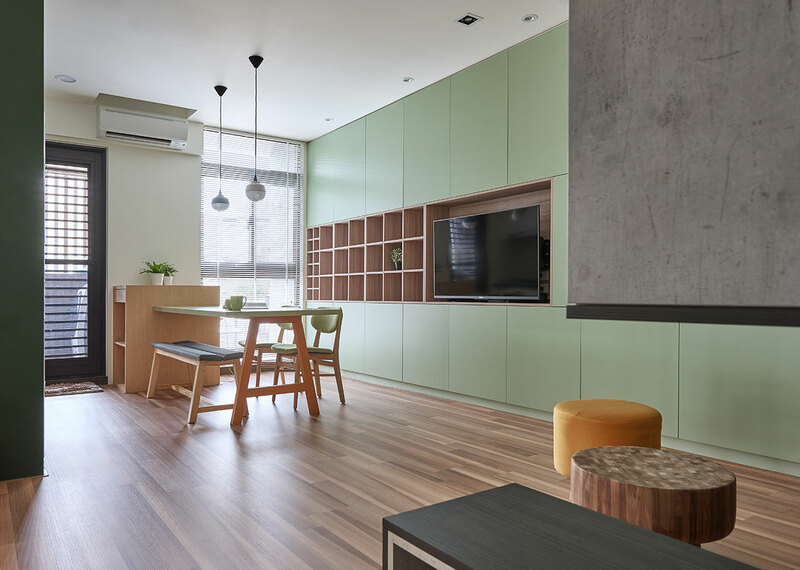 A lofty yet compact apartment renovation in Kaohsiung City, Taiwan, recently completed by local designers HAO Design, presents a wonderfully light-filled and interconnected space for a young family to call home. 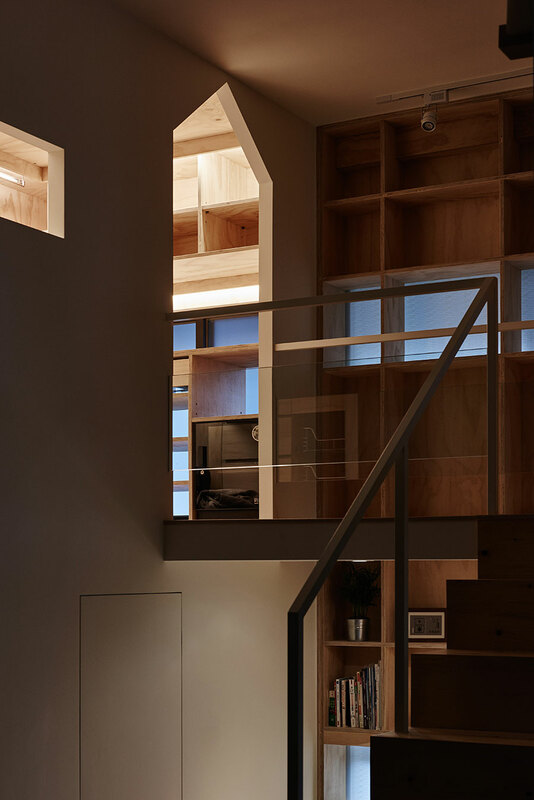 Stepping beyond the threshold of this forty-square-meter apartment, it's hard to imagine that this once used to be a cramped three-bedroom property. 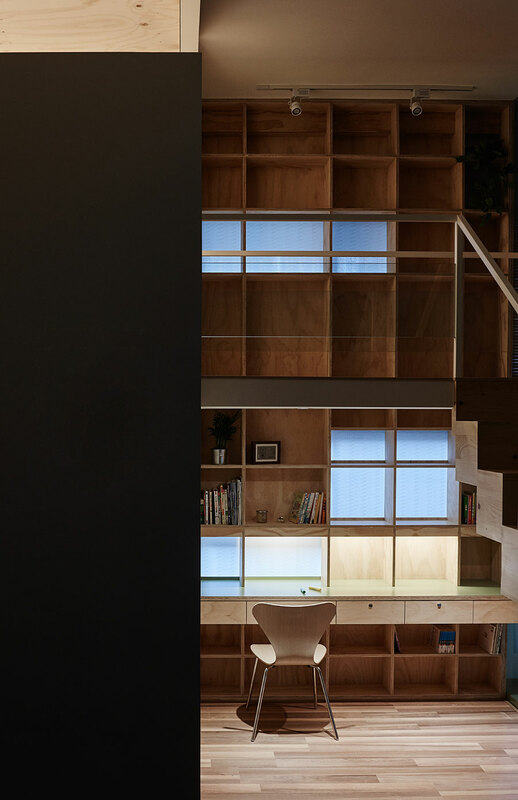 HAO Design have pushed the limits of the site’s volume by inserting a mezzanine, thereby creating a split-level, light-drenched and visually open abode. 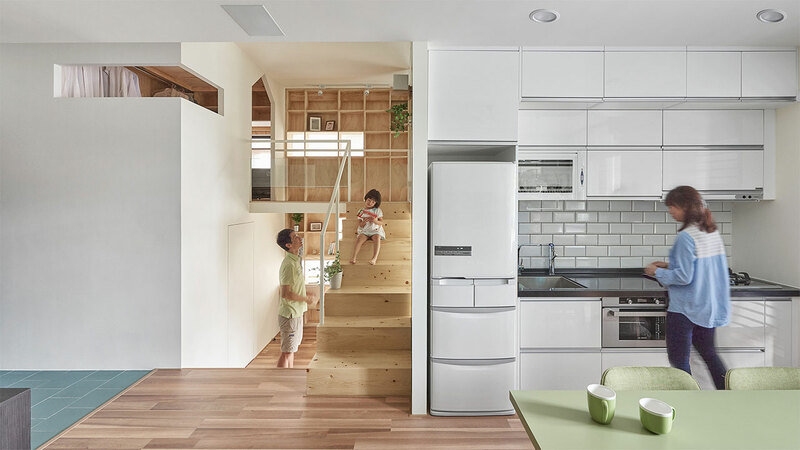 The simplicity of the concrete wall tile, crisp white kitchen, white walls, warm timber floors, paired with surfaces painted in a beautiful matcha green colour, provides a sleek and soothing envelope in which the family can spend their time. 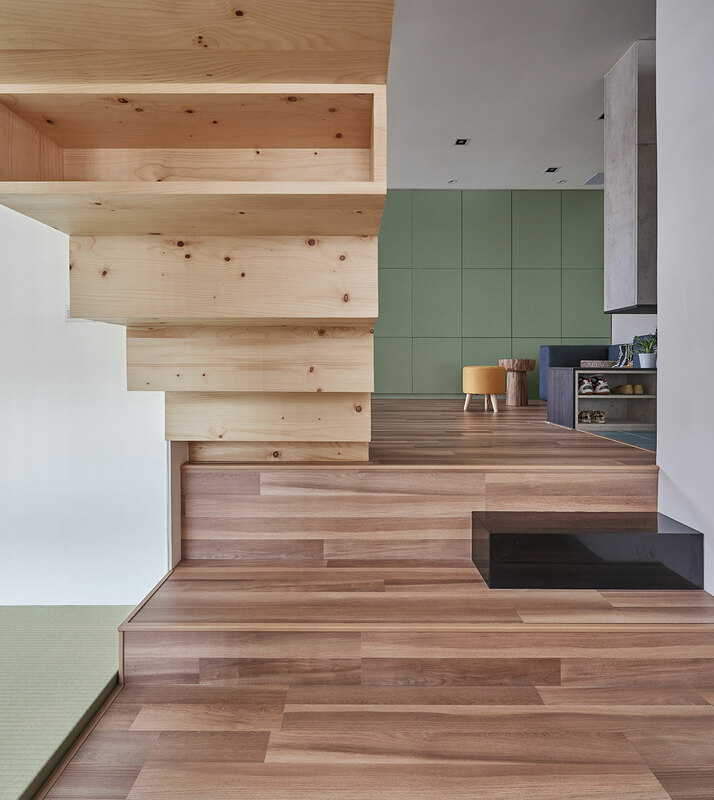 A bold block-form pinewood stair connects the family’s open living space to the mezzanine, where the master bedroom is located. 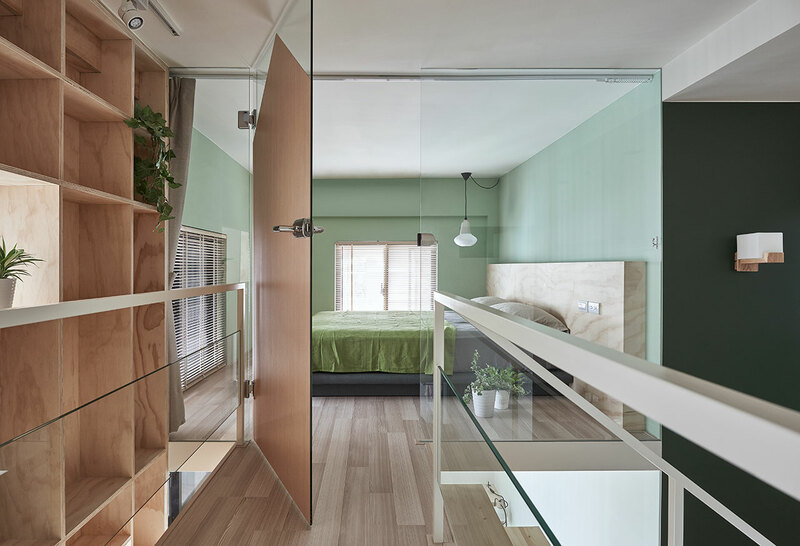 Here, a custom-made plywood bedhead and muted green walls continue the serene design language of the main space, while the clear glass wall provides transparency, allowing for borrowed light as well as a visual connection to the adjacent ‘bridge’ and living space below. 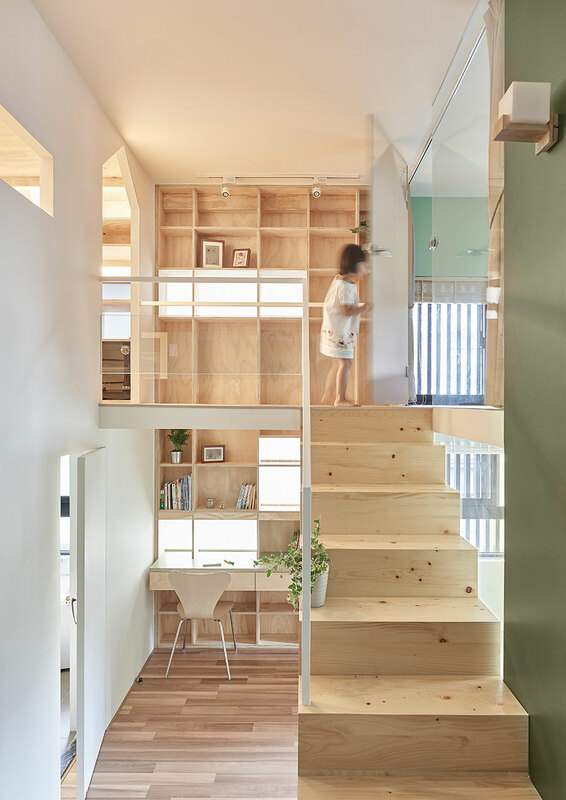 A playful pitched roof motif on the master bedroom door adds an element of fun mirrored by the opening to the walk-in wardrobe, which is right opposite. 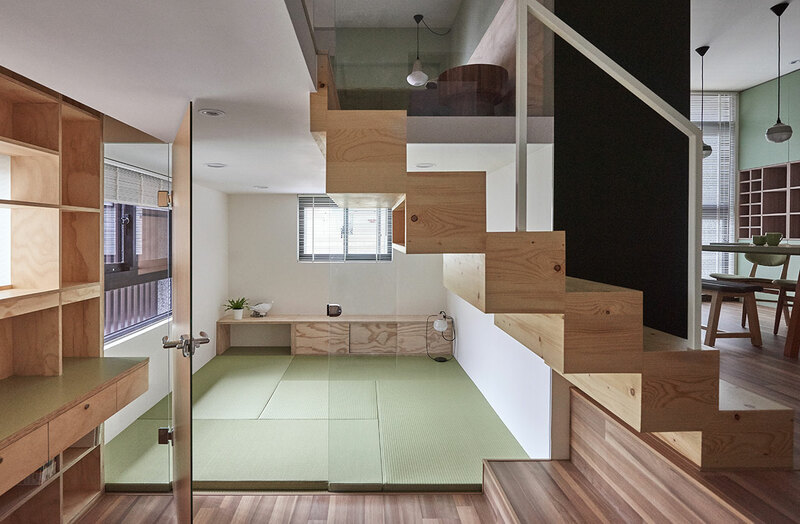 Beneath the bedroom, a black stone step leads down to a neatly integrated plywood study area, next to which a secluded washitsu (Japanese style room) with a green tatami floor has been added, which functions as a family space as well as a second bedroom. 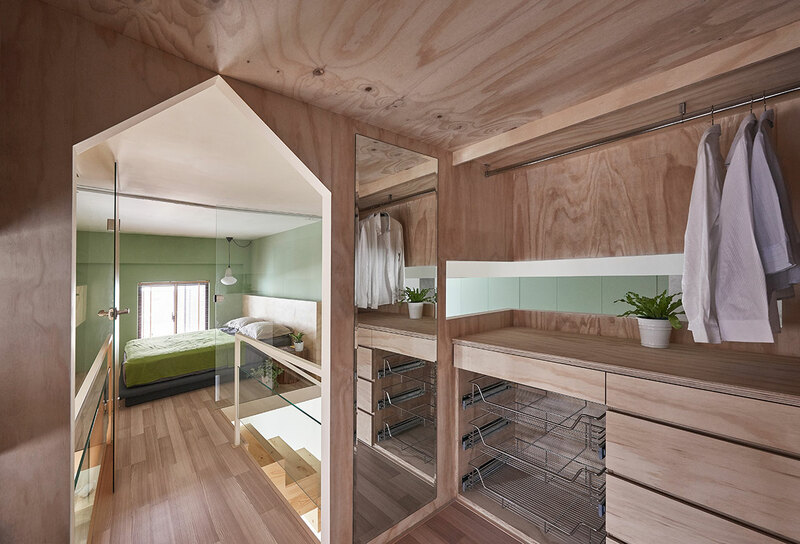 Located below the walk-in-wardrobe, the bathroom is barely detected as the door sits flush within the bare white wall. 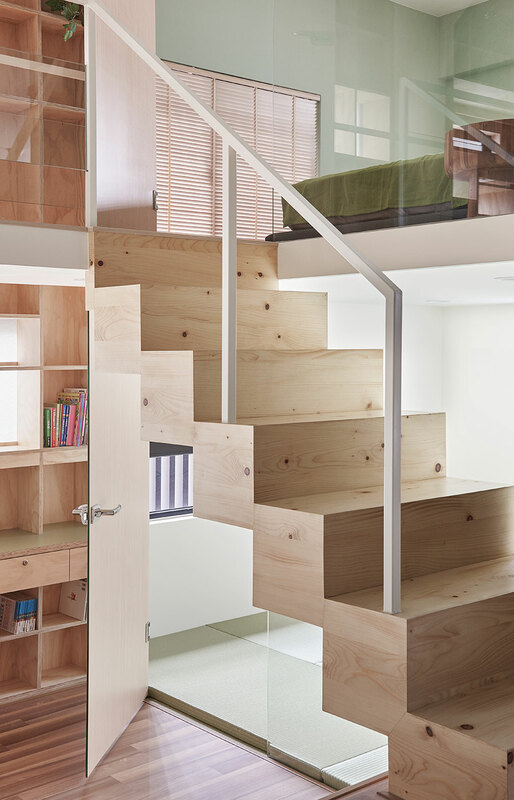 Simplicity and calmness permeates every aspect of the design, including elements of decoration and furniture. 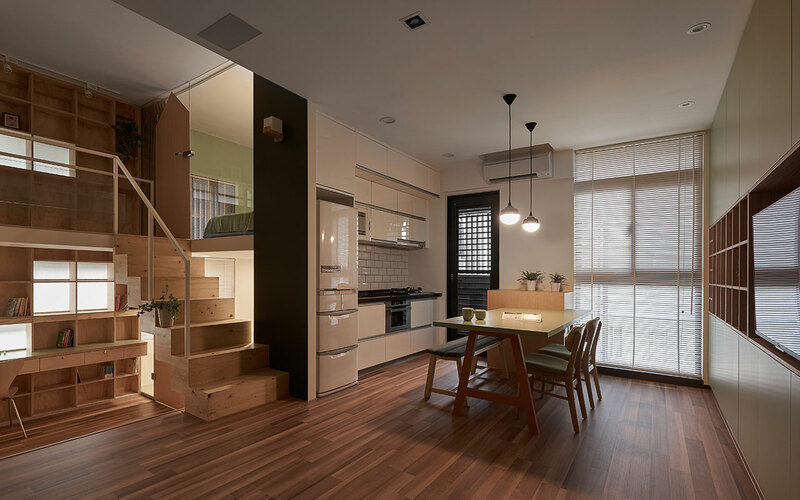 The dining table pendant lights are a modern take on the paper lantern, yet reference a vintage industrial aesthetic. 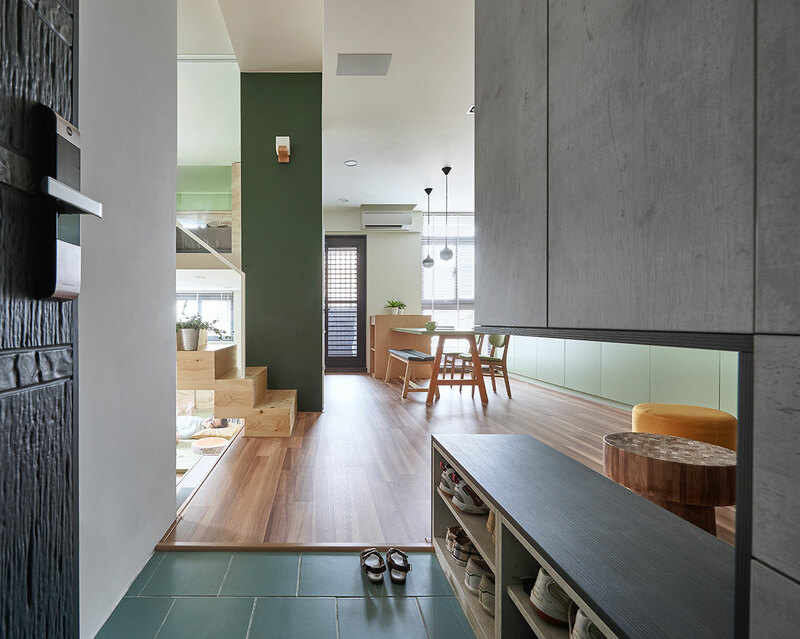 Slate grey, soft green and a touch of gold in the fabric selections, coupled with the timber detailed loose furniture provide a calm and serene aesthetic. 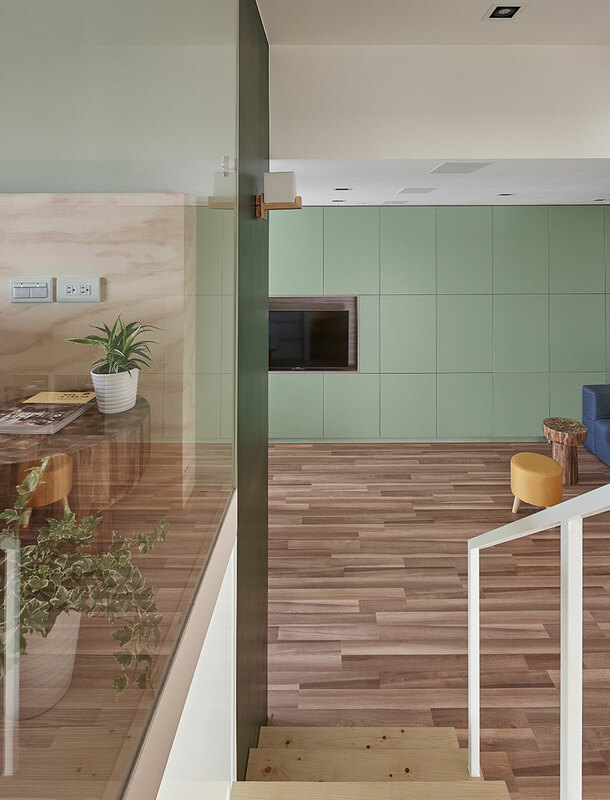 Meanwhile, a contrasting deep green wall used as a blackboard is a perfect addition for a young family to interact with and play by adding their personal mark. 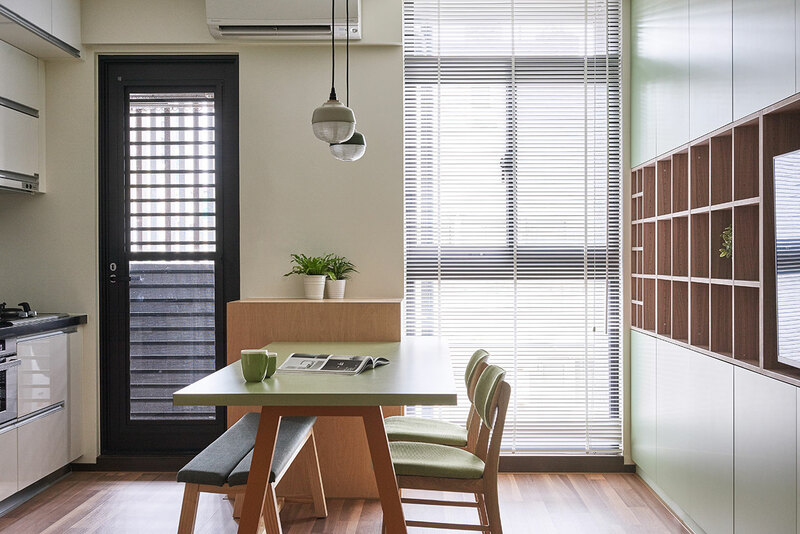 HAO Design have proven that when designers consider the inhabitants and their enjoyment of their space, a small home need not feel constricted. 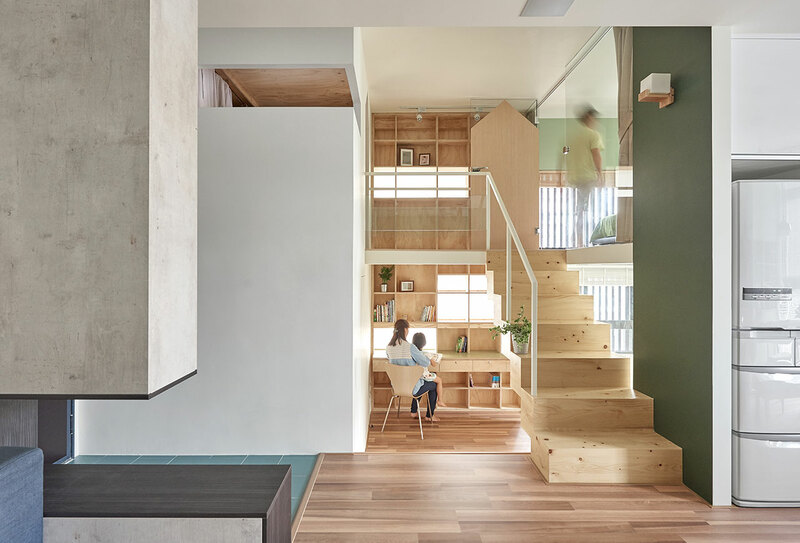 Allowing functionality, light and openness to dictate the flow and form of the space, HAO Design have created a simple, harmonious retreat that encourages the members of the family to engage with each other, bask in the light-filled space and focus on experiencing the joy of creating lasting memories together.